Today I watched an episode of Modern Family where Phil made a comment that brought understanding to what I have been feeling and experiencing recently. Claire wanted to ignore a problem she had with Gloria and just sweep it under the rug. Phil said “the problem with doing that is that eventually you will have a very bumpy rug that turns into a tripping hazard”. What a profound statement! My blog has, for the very first time in my life allowed me to be brutally honest with my emotions to myself and to people who I have not been able to be honest with before in my life (who I wish I could be). My blog has provided me such freedom and allowed me to be authentic. Having the opportunity to be totally authentic, without concern for judgement, reaction, or tension is a wonderfully freeing and empowering thing. Over the past two months I have “tripped” over the rug under which I have been sweeping things many times. I fear if I continue to sweep things under the rug, the next “trip” could be a very dangerous one. All my life I have felt the need to limit everything that I say. Regardless of what was going on in life, I felt like conversations needed to remain “fluffy” or “superficial”. Sharing any true emotions was a sign of weakness and was unacceptable. The though of crying, showing fear or nervousness in front of anyone but Steve is unimaginable to me. I want to change this. I want to be able to authentically interact with those I am closest to in person, not just on the blog. Please help me do this. 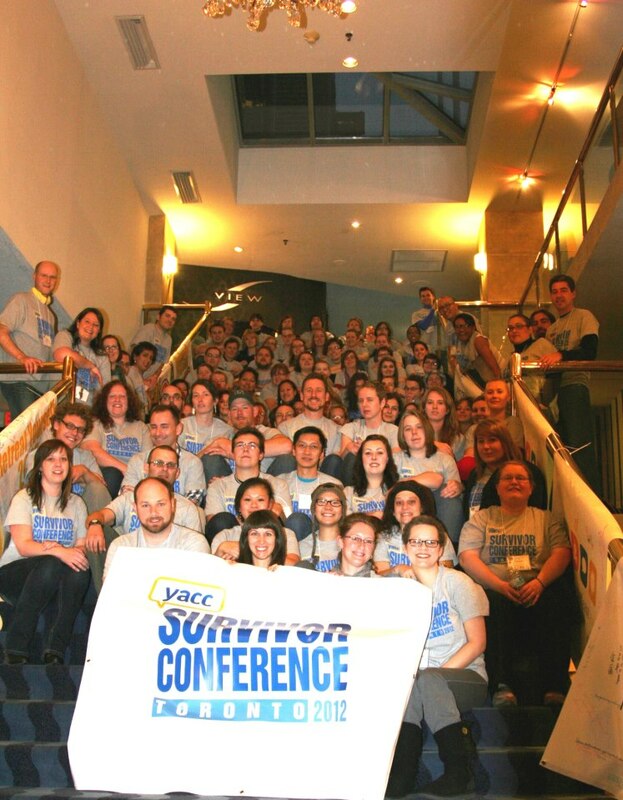 This morning I attempted to tell a close friend about the 2012 Survivor Conference (put on by the greatest organization of all time – Young Adult Cancer Canada) that Steve and I had the honour of attending last week. I use the word attempted, because all that came out was a jumbled mess of stories, feelings, information I learned, and amazing people I met. She made a great suggestion, why not do a “mind map” to try and organize things and help me reflect and take in some of what happened. So…I did! And wow did it ever help! I now have a piece of paper with so much stuff written, highlighted and drawn on it that it is unreadable. In doing this I felt three main emotions, which I really want to share and use to try and explain the time I spent with my Young Adult Canacer Canada (YACC) family. I know I probably shouldn’t start off with this, because those who weren’t at the conference won’t understand, but I need to share. I had the most fantastic time, met the most amazing people and learned sooooo much over the 5 days we spent together. After a lot of reflection and time to process my emotions I can admit that I am scared. I have been hiding this for almost a year from everyone. I am scared that the tumour will return (or never shrink), and that I will need more treatment. I am scared I might die. I am scared about what will happen after I finish treatment. I have focused so much on just getting through this year that I really have not thought much past that. What will my future look like? I have changed so much that I don’t think I am just going to be able to fall into my old life (which I naively was thinking would happen). I am scared about my future with Steve. Will we ever be able to get insurance? What about kids? What if I can never work full time? Will I be able to live with this fear of the unknown? When I was first diagnosed I thought, cancer at 23 is just a (big) bump in the road, but once I get through the year things will be right back on track. I have slowly been learning that that isn’t the case. Cancer is a total redirection. Your life takes a different road all together. My old road was so clear, and I knew where I was headed. But this this new road that is slowly unfolding in front of me is very curvy, and I can’t see around the next bend. I know that this new road is much more exciting, full of life, happiness, growth and many other positive things that were lacking pre-cancer, but it is still scary. As the title of the blog says, for the first time in almost a year I felt normal. I really did not know I wasn’t feeling normal, until I felt normal. (I hope that makes sense!). At the conference cancer was normal. No one looked at me funny, said “oooo but you look so good”, or stared awkwardly when I said I had cancer. The feelings and worries that I face are normal. Everyone in the group had or has these thoughts. We are all there to help each other and share our experiences. I felt a part of something magical, something life changing and it brought me out of isolation. It was acceptable to talk openly and honestly about emotional, physical or any struggles. I realized I did not need to worry about what will the reaction be if I tell someone I am scared of dieing or worried about returning to work. I was finally able to think, feel and share without being the “strong” one that people think I am. The conference made me more self aware and reminded me of all the wonderful things I have in my life. It was a breath of fresh air! I am so thankful for Steve and all he has done for me, given up for me, and changed to help me. I am thankful for my amazing parents, family, friends and supporters who have also helped me so much over the past 11 months. I realized that not everyone has this support and I am extremely grateful that I do. I am thankful that Geoff Eaton started Young Adult Cancer Canada, and for the amazing team he has gathered to help Young Adults like me. I am very thankful that so many survivors and supporters had the courage to attend the conference. They have helped and supported me already, and have changed my life drastically. I am thankful to feel normal again. I am thankful for my health, and the strength and energy I do have. I am also thankful for the financial support that I have received over the past year. There are so many cancer survivors who are not blessed with these amazing things. Eleven months ago I would have thought a post at around this time would be a “wrap up” post as I was preparing to “get back to life”. This post feels like the start of something instead, I feel that the challenges are no where close to over. I would say that many are just beginning. I will soon be moving from cancer patient to cancer survivor. How do I make that transition? I know that my amazing YACC family will help me though. I am honoured to be a part of this organization and am blessed to have attended the conference. Thank you, Thank you, Thank you!